Mehndi has become one of the most important attributes for any kind of wedding or religious events. There are many occasions on which the henna is applied to the hands, arms and feet and these occasions are incomplete without henna and Mehndi. There is a huge variety of designs for henna such as Pakistani, Arabic, Indian and most of all the amazing and beautiful bridal henna designs. Mehndi is an important thing for a bride on her wedding day because the bride looks incomplete without the henna as it is one of the oldest traditions especially in the Asian countries. We at Shumaila’s deal with every king of Bridal Henna and Mehndi designs. It does not matter whichever design you want to apply as long as it is applied by a professional person, a person who knows how to apply all kinds of Mehndi designs in a clean and beautiful way so that you can look more pretty and gorgeous than before. The henna is applied on the hands, arms, legs and neck, but the bridals usually prefer only full arms and feet. The functions, parties and weddings are a source of happiness and joy to people and the girls cannot imagine to enjoy these occasions without the Mehndi. There is a huge range of henna patterns, but the vines and leaf style with lovely, beautiful flowers is the most common and famous one. The uniqueness of this style are the cause of attraction for the ladies. Black and brown hues are applied by Mehndi pattern which creates a charm of art. Nowadays the Tikya Mehndi design is gaining a lot of popularity as it is a casual as well as a bridal henna pattern. The bridal Mehndi designs on the other hand, are very unique, distinctive and beautiful. 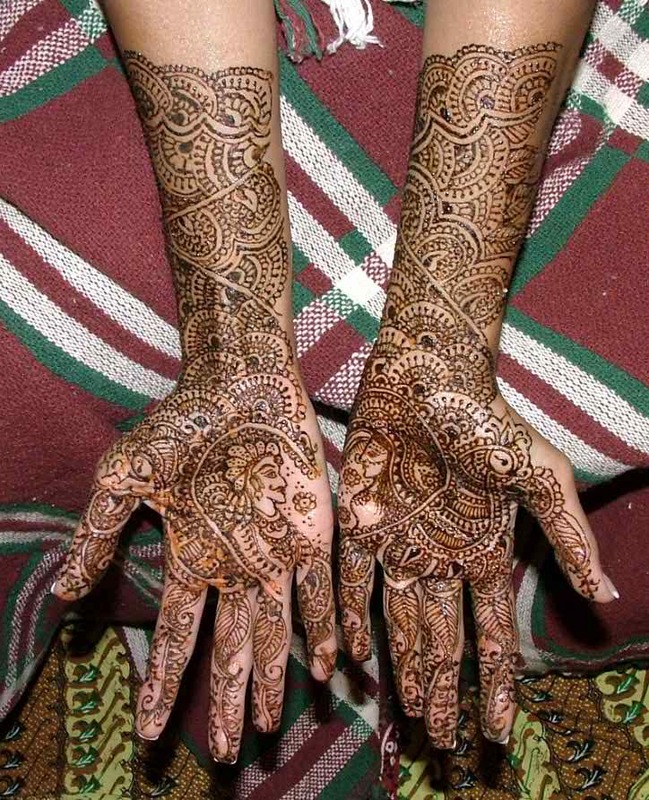 The young brides love to apply the best henna designs on their neck, arms, hands and feet. Gorgeous and amazing flowers are designed for the hands along with some shiny beads to give them a beautiful and glamorous look. Nowadays the glittering Mehndi is widely used to give the hands and feet a stunning look because of its shining and sparkling. The most famous design for the brides is the linear design with flowers. Without the Mehndi the marriage is not considered to be complete because every family wants that their bride should look the most beautiful girl in the world on her wedding day. On such occasions the black Mehndi has also gained much popularity and is the top choice of many women. There are complex henna designs for both hand and feet and motif shading is the most common of them which is applied basically with the fingers. Bridal henna and Mehndi are becoming popular day by day all over the world due to the cultural and traditional beliefs of different people. The increase in new mehndi designs has been a problem for many brides as they are confused with so many choices. At Shumaila’s we have the collection of the best and latest bridal henna designs and professionals who will help you in choosing the perfect design for your wedding ceremony so that you can look more beautiful and pretty than before.